Unfortunately, Montrose Point isn't a great place to see birds of prey though there are exceptions. When Snowy Owls are invading, Montrose is one of the more reliable places in the Chicago area to see this spectacular arctic predator. Snowies are especially fond of the Fishhook Pier but can also be found on top of the beach house or even perched on a lightpole. Short-eared Owls are often flushed from the Dunes in October and November on days with strong westerly winds; as many as 4 or 5 have been seen in the air at the same time. Long-eared Owls are occasionally found roosting in the trees or hedges during migration. The bushes and shrubs at Montrose provide cover for Northern Saw-whet Owls, which are most often seen in October and November, especially following the passage of a cold front. Peregrine Falcons can be seen at any time of the year hunting over the Point or even out over the lake, usually in pursuit of tardy migrating passerines. They have also been seen taking bats. The Peregrines seen at Montrose are invariably introduced birds or the progeny of introduced birds. Merlins are regular visitors in April and September and October. 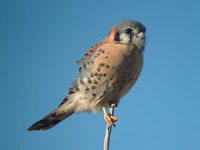 These small falcons seem to delight in terrorizing the sparrows and other passerines that gather at Montrose in spring and fall. Finally, Ospreys and Northern Harriers can be seen during migration, with September being the best month for the former and October and November the best months for the latter.